Welcome to Wiremo! 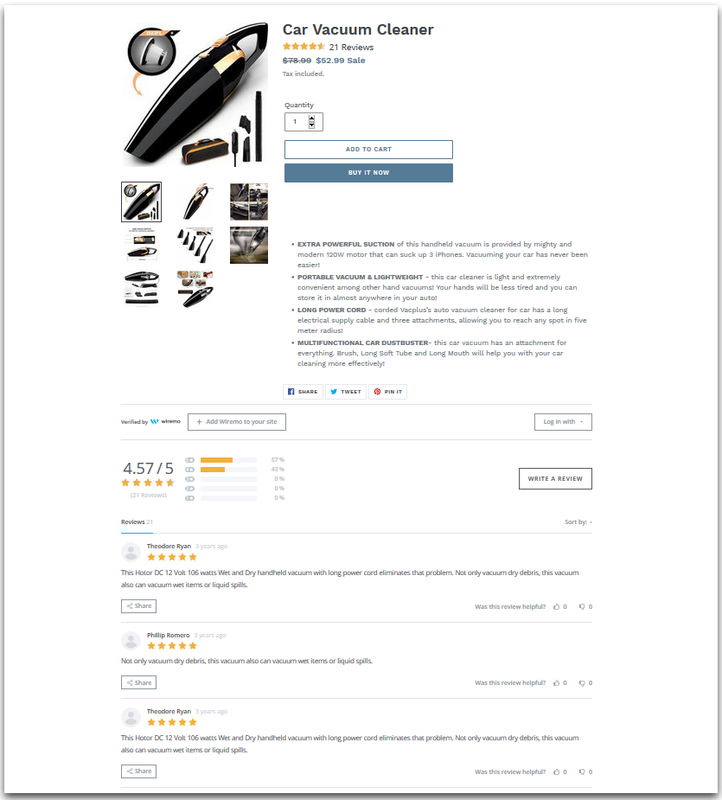 In this step-by-step tutorial, you will find out how to set up one of the best customer reviews platforms on Shopify. How to setup Wiremo widget on Shopify. 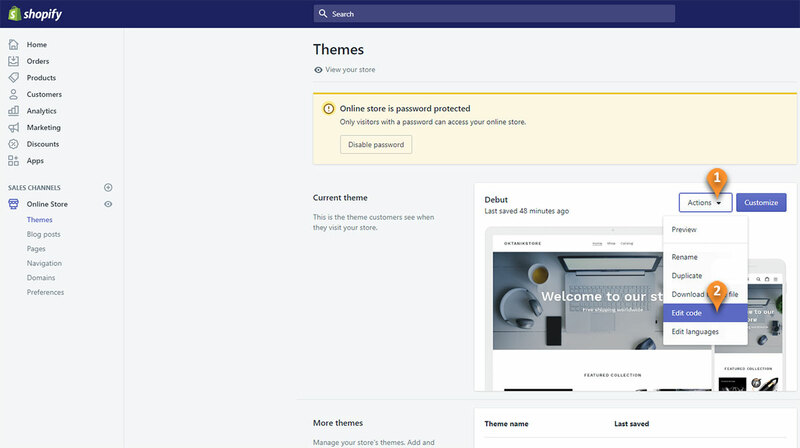 For an easier way to integrate Wiremo widget on your Shopify website, you can watch the following video tutorial or follow the steps below it. First, you need to login to Wiremo Dashboard and select “Install Wiremo” in the main menu. Type your website address and click Next. Now press on the "Shopify" button. Login to Shopify dashboard. If you have your own theme, edit yours. 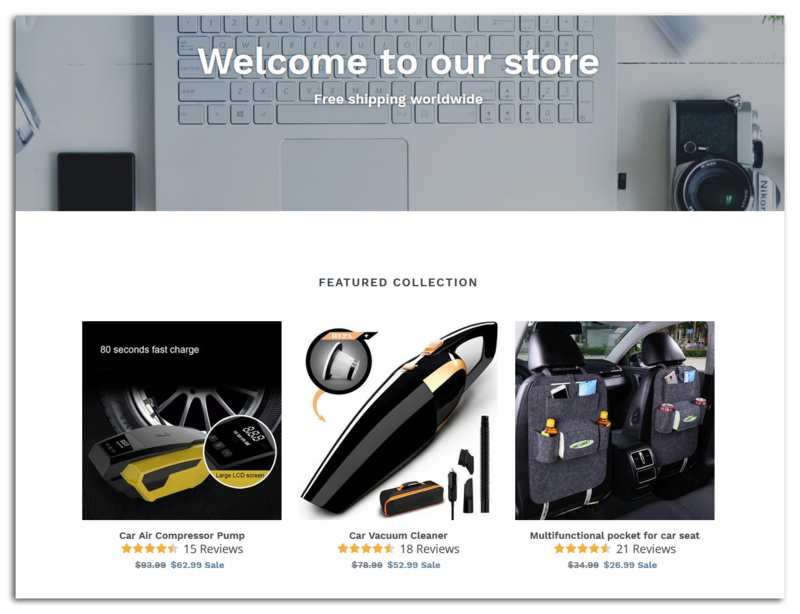 We’ve used the sample themes Shopify offers. Navigate to “Online Store” go to “Themes”, press on option “Actions” (pin 1) and choose “Edit code” (pin 2). Now you need to copy the Wiremo widget script. Go to Wiremo Dashboard->Install Wiremo and press the "Copy code" link. Under “sections” tab find “footer.liquid” and click on it. Paste the script at the end of the template file (pin4) and press the "Save" button. Under “Sections” tab, find “product-template.liquid” (pin 5) and click on it. Then paste this script below in the Shopify html box, on the bottom of the page (pin 6) and press the "Save" button. Open again Wiremo Dashboard->Install Wiremo and copy the div code (pin 7). Now place the div code where you want Wiremo to display. In the example below (pin 8), we’ve added Wiremo below the text. Go to the page where you’ve placed the widget and check it! Once you see the review widget in your page then you made everything correctly. Go back to Wiremo Dashboard->Install Wiremo and press the “Validate Website” button to activate your widget! Important:If you want to add stars to collection pages please follow the next steps. You can also customize the way wiremo widget lite is displayed by changing data type from 1 to 3. Below you can see the examples for each data type. Below you can see examples for a product page and collection page with the widget installed. Product page with Wiremo widget and widget lite. 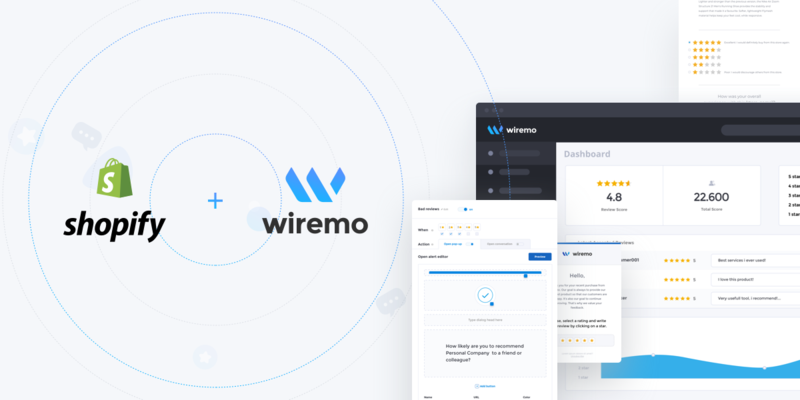 If you have any questions regarding the Wiremo integration with your Shopify store don't hesitate to contact our support team through live-chat or submit a ticket. Thank you for choosing Wiremo.